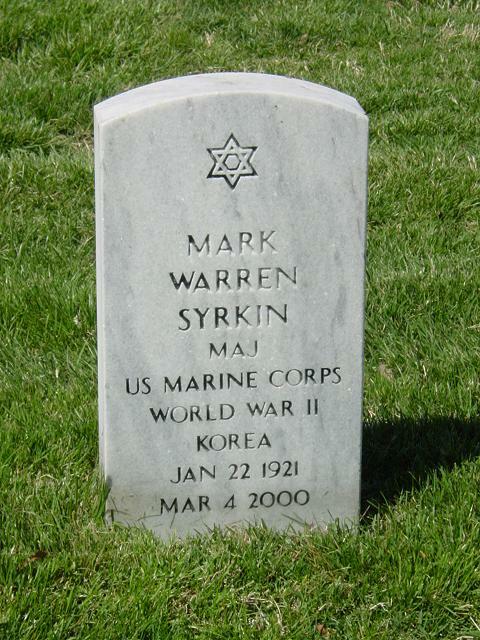 Major Mark Warren Syrkin, United States Marine Corps Reserve, retired, 79, of Charlotte, North Carolina, died Saturday, March 4, 2000. He was a highly decorated WW II and Korean War combat fighter pilot, winner of the Distinguished Flying Cross and Air Medal. He was also a member of VMF 422, VMF 211 and the Quiet Birdmen. Major Syrkin was the architect and builder of the Monument of Valor in Freedom Park, Charlotte, North Carolina, and was most recently employed by the Charlotte Visitors and Convention Bureau. He is survived by son, Andrew James Syrkin (Cathey) of Delaware, Ohio; daughter, Wendy Lynn Brody (Barry) of Chicago, Illinois; 2 grandchildren, Josh and Dana of Chicago, Illinouis; niece, Donna; nephew, Steven. Service will take place at Arlington National Cemetery, as well as a memorial service at the Monument of Valor in Charlotte, North Carolina. The family wishes to extend a special thanks to the staff at Frienship Village Health Center, Dublin, Ohio. Donations may be made to Hospice of Charlotte, North Carolina.